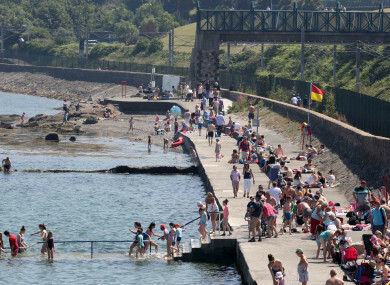 TEMPERATURES ARE SET to soar as high as 29 degrees over the next week and people are being warned to stay safe in the sun and the water as conditions heat up. Met Éireann has said that while this weekend will see temperatures hit as high as 25 degrees, that could just be the start of it. In fact, it may mean an official heatwave – five consecutive days of max temperatures over 25 degrees – may have begun. The hottest temperatures will be seen on Tuesday and Wednesday as the mercury rises to 28 and 29 degrees, respectively. And so, what that, the warmer weather and brighter evenings will see more people spending time outdoors and around water – but people are being advised to look after their skin, be mindful of fire dangers and to be careful in the water. The Irish Cancer Society has urged the public to take measures to protect their skin and following their SunSmart code. “With the onset of increasing temperatures, it is vital that people take precautions to reduce their risk of sun damage,” Kevin O’Hagan, cancer prevention manager with the Irish Cancer Society said. O’Hagan said it is especially important to protect babies and children, as much of the UV damage that leads to skin cancer takes place in the early years of life. “By protecting children and young people’s skin when they are outdoors, you can reduce their risk of developing skin cancer in years to come. But, using sunscreen alone is not enough, so make sure to follow the full SunSmart code to ensure maximum protection,” he said. Seek shade – when UV rays on at their strongest, generally between 11am and 3pm. Cover up – by wearing a shirt with a collar and long shorts. Also, wear a hat that gives shade to your face, neck and ears. Wear wraparound sunglasses – make sure they give UV protection. Slop on sunscreen – use sunscreen with SPF 30 or higher and UVA protection 20 minutes before going outside. Reapply it every two hours, and more often if you’re swimming or sweating. Babies – keep babies under six months old out of the sun. As the temperatures rise and the blue skies appear, households around the country will be opening up the barbeque for dinner. Dublin Fire Brigade has issued some tips to keep everyone safe while cooking outdoors. Place your barbeque on ground level and keep it away from anything that can catch fire. Never use a barbeque indoors or on a balcony. Have a bucket of water or sand nearby. Only use barbeque-approved starter fuel, and never use petrol or paraffin. Never leave a barbeque unattended. After cooking, make sure the barbeque is cool before moving it. Never empty the ashes into a wheelie bin. Don’t drink too much alcohol while using a barbeque. If you are using a gas device, ensure all controls are off after use. If you are using a disposable device, do not place it on a wooden table or decking. Place it only on concrete ground. Ahead of the forecasted hot weather, Irish Water Safety has issued advice to the public on how to stay safe near water. Swim within your depth and stay within your depth. Supervise children closely and do not use inflatable toys in open water. Swim at Designated Bathing Areas where lifeguards are on duty. if there is no Designated Bathing Area near you, then swim in areas that are known locally as safe and where there are ring buoys to effect a safe rescue. Make sure that the water’s edge is shallow shelving so that you can safely enter and exit. Wear a wetsuit if you are not used to cooler water. Wear a lifejacket when on or near water. Alcohol is a factor in one-third of drownings. Do not mix it with water activities. Reach out with a long object such as a branch or piece of clothing, but do not enter the water yourself. Throw a ring buoy or any floating object and call 112 for the Coast Guard. This week is National Water Safety Awareness Week and An Garda Síochána has issued the following statement: “As we enter a spell of sunny weather, make sure to take care when swimming or spending time around water. Always mind children around water and don’t drink alcohol before swimming. Too many lives are lost every year in drowning-related incidents. Email “'Stay safe, make smart decisions': Here's how to look after yourself during the warm weather”. Feedback on “'Stay safe, make smart decisions': Here's how to look after yourself during the warm weather”.